Many legends echo throughout the lands of Neopia. Legends of great battles, of fantastic discoveries and cruel betrayals. Legends of good, and evil, and sacrifice, and hope. Legends of... Pinball? What's a pinball? Can you eat it? Legends of Pinball is a typical pinball game, with the goal being to keep a ball in play while scoring as many points as possible. This is achieved by flicking the ball upward with flippers located at the bottom of the board. The left flipper is controlled with either the left arrow or the left ctrl key, and the right flipper with the right arrow or ctrl key. You will be given five balls at the start of each level, which you can launch onto the board one at a time using either the down arrow key or the space bar; the amount of time you hold down the key determines the strength of your shot. If a ball falls into the drain at the bottom of the board you will lose it, and if you lose all five balls, it will be game over. The game consists of four levels, each with unique layouts, features, and ways to progress. 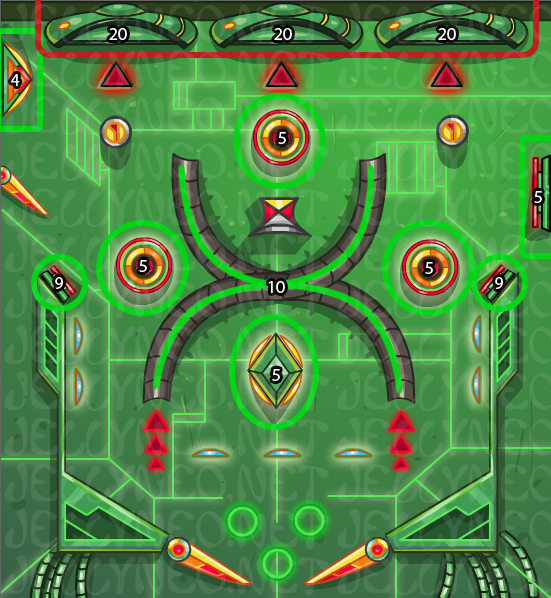 A major feature in each level is the bumpers, appearing as tents and targets in the screenshot above, and marked in green in the Level Layouts section below. Upon contact with a bumper, the ball will be launched back in the direction it came from, adding a number of points to your score. All levels but the first feature a kickout hole, which will hold your ball for several seconds before kicking it back out. 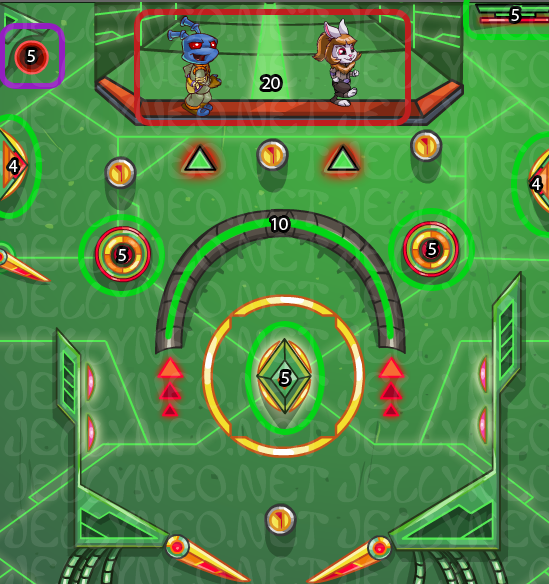 In addition to giving points, it will also activate the game's multiball mode, releasing one of your reserve balls and allowing you to launch it into play if you so choose. In order to advance to the next level, you must hit a target at the top of the screen with a ball three times. What IS that? A giant ball weapon?? In Legends of Pinball, there are two ways to earn points: hitting bumpers, and completing levels. You will gain 60 points for hitting the targets to end each level (three hits, at 20 points each), and 100 points for beating the level itself. Assuming you reach the end of the game, you will earn a minimum of 640 points. Each type of bumper in the game is worth a different number of points, ranging from 2 points for the largest (found in the final level) to 9 points for the smallest (found in the first). You will also receive 5 points every time you get a ball into the kickout hole, marked with purple in the Level Layouts section. To maximize your score, you should try to stay on a level for as long as possible, only hitting the trigger to move on to the next level when you are on your last ball. Level 1.1The first level features eight bumpers (outlined in green), with a large X-shaped habitrail in the center of the board. While your ball passing through its tunnels will earn you 10 points, try to avoid hitting a ball into it from below, as the ball will exit the top with enough force to hit the hangar doors (outlined in red). If you've already triggered the hangar door on the left, you can use the third flipper here (controlled with the left arrow and ctrl keys) to easily rack up points with the bumper in the upper-left corner. In order to advance to the next level, you must hit each of the three hangar doors once. Level 1.2The second level contains six bumpers, with a curved habitrail in the center of the board. Unlike the habitrail in the first level, its openings are both pointed downward, meaning that you can hit balls into it without fear of prematurely moving on to the next level. This is the safest and easiest way to score points. The board also features a kickout hole (outlined in violet), which will hold your ball for several seconds before releasing it, while also releasing one of your reserve balls which you may launch if you so choose. To advance to the never level, you must hit Gorix and/or Cylara three times. While this may seem difficult due to the fact that they're walking back and forth, it is incredibly easy to hit them even when launching your first ball, so avoid hitting balls into the red-outlined area until you're ready to progress. Level 2.1The third level features just four bumpers in the center of the board. 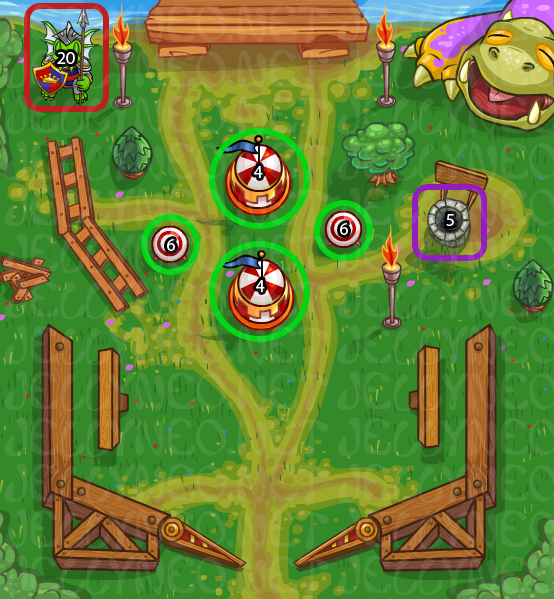 This makes it easier to score points than in previous levels, but if a ball starts bouncing around in the upper half of the screen, it's possible that it will hit the sleeping Draik Soldier. Unique to this level is the Turmaculus, which will eat your ball if given the chance. To get the ball back, click on the Turmaculus' head. 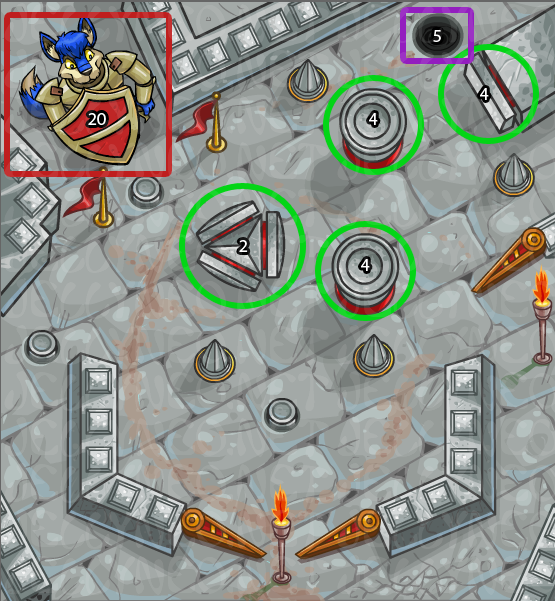 To advance to the final level, hit the Draik Soldier with a ball three times to wake him up, and he will lower the drawbridge to Meridell Castle. Level 2.2The fourth and final level holds just four bumpers, like the last level, but also features three columns which will rise up from the floor, blocking your ball. Due to the layout of the bumpers, the column on the far left, and the extra flipper on the right, this is both the easiest level to score points on, and the easiest level to keep balls in play on. In addition to this, there is a torch (known as a 'magic post') between the flippers at the bottom, preventing balls from falling into the drain. If a ball gets stuck here, you can carefully maneuver it back into play with the flippers. To end the level and complete the game, you must hit Jeran three times. Hits will count whether he is holding his shield in front of him or not. The P key can be used to pause and unpause the game at any time. Earn as many points as possible in a level before advancing to the next. Use as little power as possible when launching a ball, to avoid hitting the trigger to advance to the next level. While having multiple balls in play may seem like a good idea, it will often result in your attention being split, leading to mistakes.